To work through the DEF correctly, you have to take your time, put together the right team, and really analyze your answers to each of the questions strategically placed along the way. These are not easy questions to answer when you consider that digital touches every part of your cultural institution. When you answer each initial question, it is usually followed up by another: “Why?” It forces your team (I can’t stress how much you really need a team) to focus on the meat and potatoes (or tofu and veggies, in my case) of the matter. The more information you can provide up front – the more productive the planning process inevitably turns out to be. If you find any of this interesting – and I certainly hope you do – I have great news! Jim and Jasper have done it again – but this time the DEF has morphed into a BOOK; taking the original 16-page workbook to the next level, a 67-page book (available for FREE download here). I’ve read through the book rather quickly (because I wanted to write this post and share it with you as soon as possible) and can honestly tell you that it has already earned permanent residence on my desk. What are the biggest takeaways? You can do this – surround yourself with the right people to support the process. While one person may manage the digital execution, digital, as a concept, represents the entire organization. Digital engagement isn’t luck – to be effective you will need strategy, planning and communication. But enough about me and what I think – I had an opportunity to ask co-author Jasper Visser a few questions about the book. Check out what he had to say. Why turn the DEF workbook into a real book? In terms of the “why” I can already tell you that we decided to turn the workbook into a real book as, in the 18 months since we published the workbook, people from all over the world shared their experiences using it with us. Also, we did many projects that gave us new insights in the best ways to approach digital in cultural institutions. All these lessons from the community and things we discovered ourselves are integrated into the workbook to provide an even better guide to digital engagement strategy development. We were quite amazed that literally hundreds of organisations around the world have used the Digital Engagement Framework at one point or another. Humbling! Some of my favourite case studies have found their way into the book. What does the future hole for the DEF team? There’s a huge demand for masterclasses and workshops on an individual basis. To make this possible, we’re starting a series of webinars around all aspects of digital strategy. Hopefully this book also empowers smaller organisations to move ahead with digital strategy and I expect to be answering a lot of emails soon. There you have it. This book is about us (culture, heritage, arts organizations) and was specially created for us to do what we do, but do it better – to reach further and to connect us with our audiences in ways that weren’t possible 10, five, heck, even two years ago. This book can be a game changer for you and your organization. My advice? Download it, use it, and do something awesome. 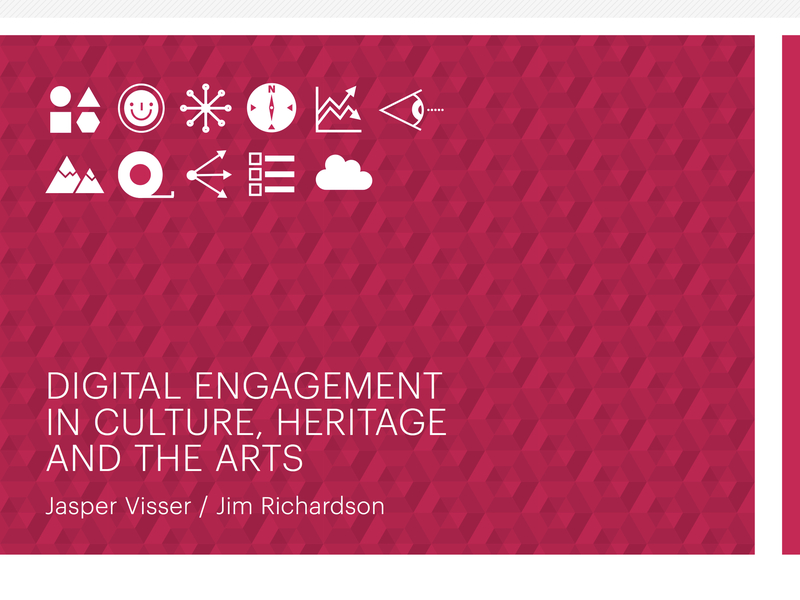 Tags: Digital Engagement Framework (DEF) Workbook, Digital Engagement in Culture, digital strategy, Heritage and the Arts, Inspired by Coffee, Jasper Visser, Jim Richardson, Sumo. Bookmark the permalink.